Manie’s tooth began to hurt. 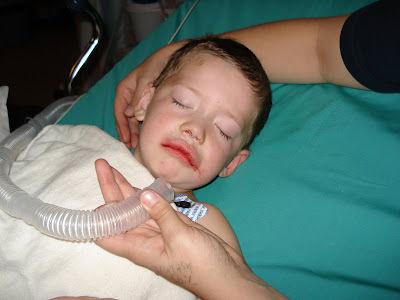 recap: Manie had real bad acid reflux and was on an adult dose of prevacid for six months. The acid reflux ruined Manie’s teeth. He goes to the dentist,an hour and a half away from where we live because no one else will work on him due to his heart condition. At this dentist in the past they have worked on his teeth without Novocaine or nitrous oxide. They strap him to a board and start digging. Manie’s tooth is hurting so bad he ask me if I will take him to the dentist to take his tooth out. As terrified as Manie is of the dentist I know he must be in pain if he wants me to take him to the dentist. I called right away to get Manie in to the dentist. The only time they can work us in is Wednesday October 24. I take the appointment. I was gone all morning and I finally got home around 11:30am. I checked my messages.A lady from the dentist office called and wanted me there at 1:00pm that day. I have five kids and three go to school so that was not going to be possible I would have never made it there on time. Then one of the dentist calls me back and tells me that they have a open spot for surgery on Friday the 26th of October,they wanted to put Manie under and do all his teeth at once. We traveled an hour and half to the hospital where Manie has to see the cardiologist and have an echo and ekg done. We were there over an half an hour early and they called us back an hour after our appointment time. I had Manie, his baby sister Lilly and my son Grif with us. Grif had to miss school for three days because of Manie’s surgery. Thank God that Manie’s grandpa on his dads side was able to go and help with the kids. Do you know how bad it is for the kids when they have to wait and wait and wait. Everything went alright and the cardiologist preapproved Manie for surgery. We drove our hour and a half back home after our three and a hour hour event at the doctors. We woke up extra early to be back up at the hospital for another check up this time with the dentist who would do the surgery and one of the hospitals pediatricians. Everyone had been sick with the flu and cold etc… so Manie had a runny nose and cough. They decided that Manie was healthy enough to go ahead with the surgery the next day. This one appointment took about two hours total and then we had to go to the other side of the hospital to the pharmacy to get the prescription for his antibiotic for the surgery. 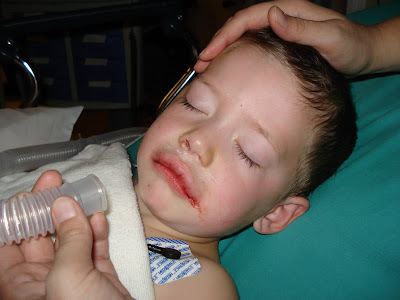 Any time Manie has surgery or dental work done he has to have an antibiotic to help prevent infection. After dropping off the prescription we head to anesthesia because they have to also do a physical to ok him for surgery. I think it is a great idea to have all these Dr’s checking him out making sure he is good enough to go through surgery, but the waiting is pure human torture especially when we are talking about little kids. It was another hour wait at anesthesia. I had been told that the surgery would be at 6:00 Friday morning so we decided to get a hotel room instead of going all the way back home. When we got ready to leave the hospital the anesthesiologist told me that they would call me before 5:00 that evening to tell me what time surgery was the next day. Errrrr so I gave them my cell phone number three times because we were not going to be at home. I triple checked to make sure they had the right number then we left. We went and picked up the prescription and went to the hotel. I waited and waited for the phone call and never got one. I called the hospital at 5:15 and they told me they tried to call but I was not there and the answering machine was full. They had called my home phone not my cell phone and I had to give my cell phone number again because they did not have it. Manie’s surgery would be at 9:45am instead of 6:00 like they had told me. I was to give him the antibiotic at 8:45am and we had to be at the hospital at 8:45am. I took the antibiotic out and smelled it. WOW I have never smelled something so putrid in my life it smelled like a cross between decaying rotten feet and cow manure. I am not over reacting and it did not taste any better either. We woke up the next morning Manie had his last bit of apple juice at 7:45am and he could not have anything to eat at all. I tried to give him his dose of 18ml of feet and manure at 8:45am he gaged it back up so I bribed him in to taking it the second time he took it and kept it down. Manie is the toughest guy I know. I would have not taken that medication for anything. We get Manie checked in and wait some more. About three hours more. The surgery was delayed because the surgery before his was taking extra time. Finally Manie gets called back for surgery. I get to hold him while they give him anesthesia he was so tired it took about five seconds for him to go to sleep. I told him I loved him and gave a kiss and went to wait for another three and a half hours. The dentist put caps on all his back teeth and did filling on the front ones. She also had to pull out one of his teeth because it was too far gone. Manie pulled through and now he is sitting here playing with his new toy that I promised he would get if he took that horrid medicine. I thank God that everything went alright and we are back home. Thanks everyone who prayed and helped out during this hard time. ← Isn’t This Against the LAW!!!!!!!! What a horrible thing for a little boy to have to go through. My heart aches for you Manie. As for Manies family continue to be strong. Thanks for the support! Manie is my little superhero.